جعفری, ناصر. (1393). مقایسه جذب زیستی فلز سنگین کادمیم از محلول آبی به‌وسیله دو جلبک قهوه‌ای سیستوسیرا اندیکا و فوکوس سراتوس. مجله آب و فاضلاب, 25(6), 30-35. ناصر جعفری. "مقایسه جذب زیستی فلز سنگین کادمیم از محلول آبی به‌وسیله دو جلبک قهوه‌ای سیستوسیرا اندیکا و فوکوس سراتوس". مجله آب و فاضلاب, 25, 6, 1393, 30-35. جعفری, ناصر. (1393). 'مقایسه جذب زیستی فلز سنگین کادمیم از محلول آبی به‌وسیله دو جلبک قهوه‌ای سیستوسیرا اندیکا و فوکوس سراتوس', مجله آب و فاضلاب, 25(6), pp. 30-35. جعفری, ناصر. مقایسه جذب زیستی فلز سنگین کادمیم از محلول آبی به‌وسیله دو جلبک قهوه‌ای سیستوسیرا اندیکا و فوکوس سراتوس. مجله آب و فاضلاب, 1393; 25(6): 30-35. فلز کادمیم اثرات بدی بر روی اعصاب، کلیه و جنین دارد و همچنین با اثر سرطان‌زایی باعث مرگ می‌شود. جذب زیستی نسبت به روش‌های دیگر حذف فلزات سنگین، مزایایی دارد که از جمله مهم‌ترین آنها می‌توان به کارایی بالا برای حذف از محلول‌های رقیق، فراوانی حضور آنها در طبیعت و استفاده چند باره از این جاذب‌ها اشاره کرد. در این تحقیق توانایی زی توده خشک دو جلبک قهوه‌ای سیستوسیرا اندیکا و فوکوس سراتوس برای جذب فلز کادمیم مورد برسی قرار گرفت. جلبک سیستوسیرا اندیکا از ساحل دریای عمان و فوکوس سراتوس از ساحل اقیانوس اطلس جمع‌آوری شده است. جلبک‌ها ابتدا خشک شد، سپس سه بار با آب معمولی و پس از آن با آب مقطر بدون یون شستشو داده شد. آنگاه به قطعاتی با قطر 5/0 تا 0/1 میلی‌متر جداسازی شد. برای همه آزمایش‌ها از آب مقطر استفاده شد و به آن میزان مشخص از کادمیم اضافه و آنگاه جلبک افزوده شد. بعد از تماس جلبک وفلز، میزان فلز در محلول قبل و بعد از آزمایش به‌وسیله دستگاه جذب اتمی اندازه‌گیری شد. pH بهینه برای جذب فلز کادمیم، برابر 3/0±5/6 و 3/0±5/5 به‌ترتیب برای سیستوسیرا و فوکوس بود. بیشترین میزان جذب فلز در هر دو جلبک درpH اسیدی رخ داد. زمان به تعادل رسیدن جذب فلز به‌وسیله سیستوسیرا و فوکوس به‌ترتیب 360 و 300 دقیقه بود. با استفاده ار معادله ایزوترم لانگمیر، مدل خطی ظرفیت جذب کادمیم به‌وسیله دو جلبک سیستوسیرا و فوکوس 44/58 و 54/95 میلی‌گرم بر گرم وزن خشک جلبک به‌دست آمد. گروه‌های عاملی دخیل در جذب فلز کادمیم در سطح دو جلبک شناسایی شدند. نتایج این تحقیق نشان می‌دهد جلبک فوکوس کارایی بالاتری در مقایسه با سیستوسیرا در جذب فلز کادمیم دارد. The cadmium metal not only has detrimental effects on the nervous system, the kidneys, and the human fetus but is also lethal because of its carcinogenic effects. Biological absorption of cadmium has a number of advantages over conventional methods that include high removal efficiency for eliminating heavy metals from dilute solutions, availability and abundance of the required materials in nature, and reproducibility and reusability of the materials. In this study, the biosorption of cadmium (II) ions onto the dry biomass of two brown algae, Cystoseira indica and Fucus serratus, was investigated. Cystoseira indica was collected from the coastal areas of the Oman Sea and Fucus serratus was collected from the coastal area of the Atlantic Ocean. The algae were first dried, washed three times with tap water, and finally washed with distilled water without ions before they were isolated in pieces 0.5-1.5 mm in diameter. In all the experiments, distilled water was used to which known amounts of cadmium were added before the algae were introduced into the solution. The metal ion concentrations in the solution were measured using the atomic absorption spectrophotometer before and after the metal came into contact with the algae. The optimum pH for the adsorption of cadmium was found to be 3/0 ± 5/6 and 3/0 ± 5/5 for Cystoseira indica and Fucus serratus, respectively. The maximum metal uptakes by both algae were observed in acidic pH conditions. The time required for the biosorption of the metal to reach equilibrium was 360 minutes for Cystoseira indica and 300 minutes Fucus serratus. The adsorption capacities for Cystoseira indica and Fucus serratus using the Langmuir isotherm were determined as 44/58 and 54/95 mg /g, respectively. Moreover, the functional groups involved in cadmium uptake in both algae were identified. Finally, the results of this study showed that Fucus serratus algae had a higher capacity for adsorbing cadmium ions than did Cystoseira indica. 1. 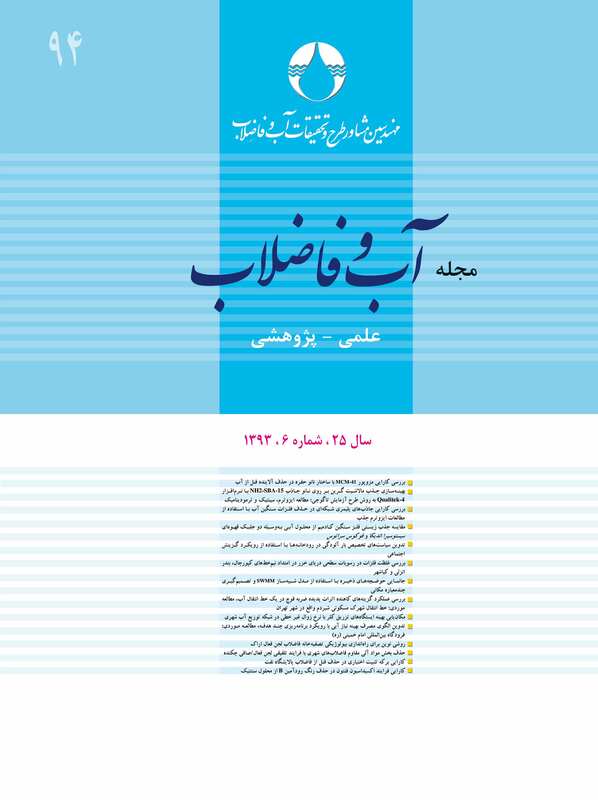 Sepehr, M.N., Nasseri, S., Zarrabi, M., Samarghandi, M.R., and Amrane, A. (2012). “Removal of Cr (III) from tanning effluent by Aspergillus niger in airlift bioreactor.” Separation and Purification Technology, 96, 256-262. 2. Zarrabi, M., Sepehr, M.N., and Amrane, A. (2012). “Removal of Cr (III) from model solutions by isolated Aspergillus niger and Aspergillus oryzae living microorganisms: Equilibrium and kinetic studies.” J. of the Taiwan Institute of Chemical Engineers, 43, 420-427. 3. Gadd, G.M., and White, C.H. (1993). Microbial treatment of metal pollution a working biotechnology.” Trends in Biotechnology, 11, 353-359. 4. Xeu, H.B., Stumm, W., and Sigg, L. (1988). “The binding of heavy metal to algal surface.”Water Research, 22, 917-922. 5. Iyer, A., Mody, K., and Jha, B. (2005). “Biosorption of heavy metals by a marine bacterium.” Marine Pollution Bulletin, 50(3), 340-343. 6. Tunali, S., Akar, T., Ozcan, A.S., Kiran, I., and Ozcan, A. (2006). “Equilibrium and kinetics of biosorption of lead (II) from aqueous solutions by Cephalosporium aphidicola.” Separation and Purification Technology, 47(3), 105-112. 7. Hansen, H.K., Ribeiro, A., and Mateus, E. (2006). “Biosorption of arsenic (V) with Lessonia nigrescens.” Minerals Engineering, 19(5), 486-490. 8. Holan, Z.R., Volesky, B., and Prasetyo, I. (1993). “Biosorption of cadmium by biomass of marine algae.” Biotechnology and Bioengineering, 41, 819-825. 9. Prasher, S.O., Beageard, M., Hawari, J., Bera, P., Patel, R.M., and Kim, S.H. (2004). “Biosorption of heavy metal by red algae (Palmaria palmate).” Environmental Technology, 25, 1097-1106. 10. Langmuir, I. (1916). “The constitution and fundamental properties of solids and liquids.” J. of the American Chemical Society, 38, 2221-2295. 11. Romera, E., Gonzalez, F., Ballester, A., Blazquez, M.L., and Munoz, J.A. (2008). “Biosorption of heavy metal by Fucus spiralis.” Bioresource Technology, 99, 4684-4693. 12. Lodeiro, P., Barriada, J. L., Herrero, R., and Vicente, M.E. (2006). “The marine macroalga Cystoseira baccata as biosorbent for cadmium (II) and lead (II) removal: Kinetic and equilibrium studies.” Environmental Pollution, 142, 264-273. 13. Chen, Z., Ma, W., and Han, M. (2008). “Biosorption of nickel and copper onto treated alga (Undria pinnatifida): Application of isotherm and kinetics study.” J. of Hazardous Materials, 155, 327-333. 14. Ahmady-Asbchin, S., and Jafari, N. (2013). “Cadmium biosorption from aqueous solutions by Fucus vesiculosus L.: Sorption mechanisms.” International Journal on Algae, 15(1), 91-102. 16. Abyar, H., Safahieh, A., Zolgharnein, H., and Zamani, I. (2012). “Cadmium biosorption by Achromobacter piechaudii isolated from Persian Gulf sediments.” J. of Oceanography, 3(10),19-25. 17. Basha, S., and Murthy, Z.V.P. (2007). “Seaweeds for engineering metal biosorption: A review.” Mason L.G. (Ed.) Focus on hazardous materials research, Nova Science Publishers Hauppauge, New York.